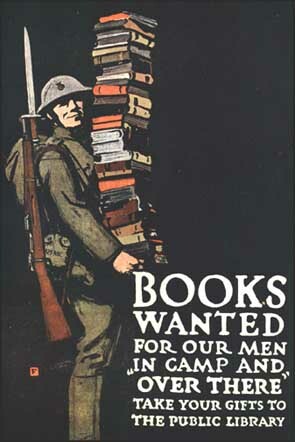 Illustrator and theatrical designer Charles Buckles Falls created this lithograph to promote the American Library Association's First World War book drives for soldiers. Donated books were seen as a key to keeping up morale, and stocked temporary wartime libraries, as well as being given directly to soldiers. The most popular books on the frontlines were adventure and detective fiction, biographies, military histories, and travel journals. As the war wound down, soldiers began to request titles on farming, business, engineering, construction and other trades in preparation for the return to civilian life. It was the first, but sadly not the last, modern global war. Billed, with what is now seen as insanely optimistic myopia, as "The War To End All Wars," and "The War To Make The World Safe For Democracy." Now we call it "The First World War." The US was entering this war several years in, after a period of deliberate isolationism. It would be the nation's first war on distant shores. Support for the war effort was soft. The armed forces could be built up through the draft. But how to win over the men, women, and children on what came to be known as "the home front?" A traveling library exhibit, sponsored by the National Endowment For The Arts (NEA), spotlights a group of graphic artists and illustrators who used their talents to persuade citizens to stand with the soldiers, and make sacrifices for the cause. The exhibit, The Winds and Words Of War, showcases images created by the Division of Pictorial Publicity, part of the Committee on Public Information of the US government. Assembled within weeks of the nation's entry into the war, this group was charged with creating posters which would build patriotism, raise funds for war bonds, encourage enlistment, and increase volunteerism. 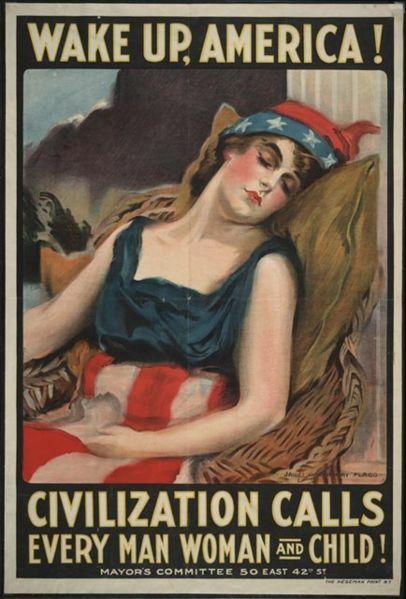 More than 300 of America's most famous illustrators, cartoonists, designers, and fine artists donated their services to the division from April 1917 until the armistice in November 1918. They created some 700 posters, more than were produced by any other nation in the conflict. Forty of these original works, on loan from the permanent collection of the San Antonio Public Library, make up the traveling exhibit. 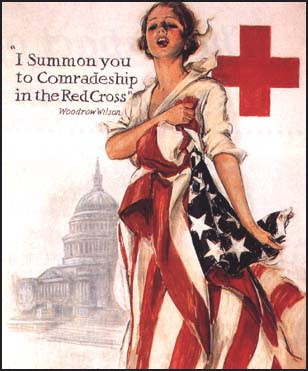 Magazine illustrator Harrison Fisher created this poster to support the desperately needed expansion of the Red Cross. The organization was struggling to cope with the massive increase in demand for field hospitals, hospital ships, and services to displaced persons and POW's. Harrison Fisher was known as "The Father Of A Thousand Girls." At the height of his popularity in 1913 he was earning $75,000 a year for his magazine illustrations of an idealized "American Girl," described by Cosmopolitan Magazine as: "Young with the youth of a new country, strong with the vitality of buoyant good health, fresh with clear-eyed brightness, athletic, cheerful, sympathetic, and beautiful." Despite such hyperbole, and all the cash that came with it, Fisher became tired of drawing "marketable females" and turned exclusively to portraiture at the end of his career. Two of his subjects were F. Scott and Zelda Fitzgerald. A well respected illustrator of ships and seascapes, William Haskell Coffin created this striking image of medieval war heroine Joan of Arc to encourage American home front heroines to buy War Savings Stamps. Stamps could be purchased for a dime or a quarter, and collections could ultimately be converted into War Bonds. (The program raised over one billion dollars for the war effort.) Coffin enjoyed great success as a commercial artist, creating iconic beauties to sell calendars, clothing, soft drinks, and cosmetics. At the peak of his fame, Coffin married a popular stage actress, Frances Starr, and the two became glittering fixtures on the New York social scene of the 1920's. They divorced in 1930, and Haskell's fortunes took a downward turn. He committed suicide in 1941. Howard Chandler Christy took naturally to creating wartime posters: he had begun his career in Cuba, illustrating battlefield scenes of American troops during the Spanish American War. He later turned to more commercial forms of illustration, specializing in images of women as independent as they were beautiful. Here he combines the two strands of his career to encourage enlistment in the Navy. 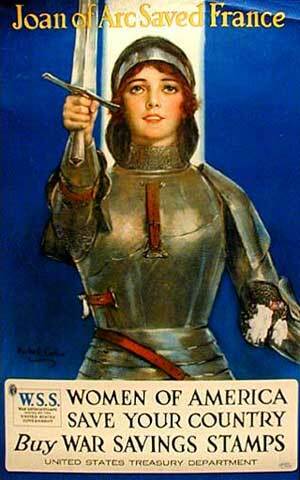 Another poster by Howard Chandler Christy, this one to help finance the federal government. 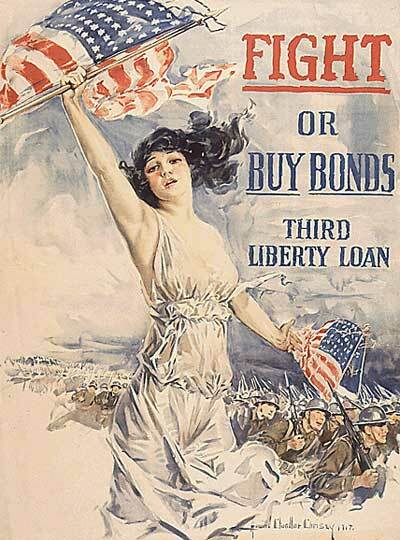 Driven by the need to purchase munitions and supplies, and to provide pay for increasing numbers of soldiers, the US Treasury Department called on citizens to invest in Liberty Loans and War Bonds. This poster helped to make the Third Liberty Loan drive more successful than any previous fundraising effort in US history. (Between 1917-1918, Americans lent $21.5 billion to the war effort.) Like Harrison Fisher, Christy later became equally well-known as a portraitist. One of his works was a commissioned portrait of President Calvin Coolidge. 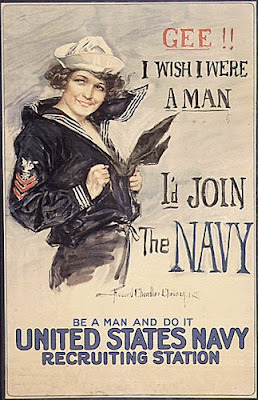 James Montgomery Flagg is best known for creating the iconic enlistment posters of Uncle Sam. (The face is the artist's own, used to spare the trouble and expense of hiring a model.) This poster shows him in a less flamboyant mode. It was created for the New York City Mayor's Committee, formed to assist with the war effort. Flagg was a child prodigy who began his near-50-year illustrating career at age 12, when he was hired by St. Nicholas Magazine on the basis of a few sketches he had drawn in Central Park. By 15 he was a staffer at Life and Judge Magazines. Over 4 million copies of Flagg's Uncle Sam poster alone were produced during the First World War, and the image was equally popular during the Second World War. Flagg was the highest paid illustrator in the US throughout much of his career. "The Winds and Words of War" exhibit premiered at the San Antonio Public Library in 2008 in conjunction with the 90th anniversary of Armistice Day, and marked the first public display of the posters since 1933. The entire collection of lithographs was given to the library by a single generous collector, the late Harry Hertzberg. The traveling exhibit formally debuted at the Chicago Public Library, and has since been shown at the Wichita Public Library, The Kansas City (Missouri) Public Library, and the Evansville (Illinois) Vanderburg Public Library. It opened on March 19, 2010 at the Harford County (Maryland) Public Library, and will move on to the Memphis Public Library, and to Sarah Lawrence College in New York State later in the year. These works of art stand as a beautiful monument to an ugly war: the death toll for "The Great War" is estimated at from 15 million to 65 million people worldwide.